Push the tab that says show full description to view all 41 names. I have no option to download it either. Updated through 9/28/2016. I used a different site to upload the results this time, hopefully this solves any problems people had with downloading. Got it this time. Thanks for the work you put into this. I think this is the most accurate list I have seen. Nice work. Click on the tab that says "show full description" to see all 41 names. Thank you Prof for doing the hard part and getting the ranking ready to be updated. Also thank you Alex for also working hard with this ranking and allowing it to be possible. Remember to push "show full description" to see all 41 ranked players. Bravo to all you hard workers! Thanks for keeping the NASF alive! I'm glad to see the regular season and playoffs was implemented. I hope to see the NASF continue to grow. You are all awesome! "Everyone pities the weak, jealousy you have to earn." Thank you The Prof for being the one that puts in the work of doing this! I used to live in the north and heard this expression quite often. Once I moved to a more southern state I did not hear this phrase as often. I am assuming you live in a northern state? The question is, did you spit it out or swallow it? No, --Wogomite--, the REAL question is, did he video or live stream this historic moment? NASF will find a donor to pay top dollar to acquire broadcast rights as a follow up to the Toilet Bowl game featuring Gwynplaine vs. Gwynplaine! "I try to think, but nothing happens!" did you spit it out or swallow it? 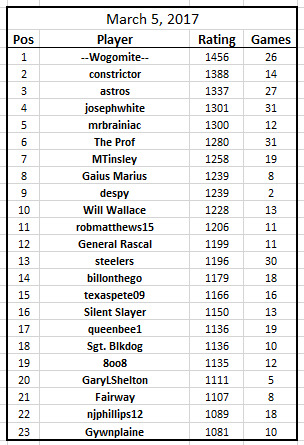 WINNER of the first ever Astros Stratego Series! By the end of the open games period, all players will be required to have at least 6 games to appear in the rankings. Here is a list of all current NASF members and the number of games they have played. So if you are a few short, just get playing Open Games and you'll get an official NASF rating! That is a different phrase for me as well. I looked it up and apparently it comes from a 2004 movie called Dodgeball. I place this solidly in the benefit column for avoiding that piece of popular culture.